I am a firm believer that stews shouldn't be restricted to cosy winter nights. A light summer broth, like this one made from rosé and packed with spring vegetables, makes for a great dinner party dish. 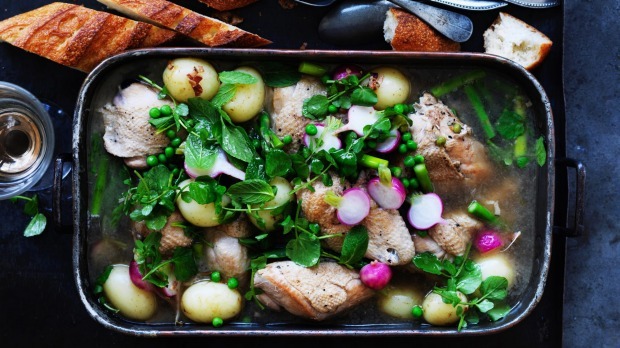 Serve with another bottle of rosé, for an excellent al fresco one pot feast. This is also a good make-ahead dish to have up your sleeve if you are having a mid-week dinner party. 1. Place a large, heavy-based saucepan over a medium heat. Once hot, add the bacon. Cook for three or four minutes, until the bacon fat renders and the bacon is beginning to colour. Use a slotted spoon to scoop out the bacon into a bowl, leaving the fat behind in the pan. 2. Season the chicken pieces generously with salt and pepper. Brown the chicken in batches (so as not to crowd the pan) for about four minutes on each side, before transferring the brown pieces to a tray and repeating until all the pieces are a golden colour. Keep all the fat that has accumulated in the pan. 3. Return the bacon and the chicken pieces to the pan, not forgetting the lovely juices in the chicken tray. Pour in the rosé, herbs and top up with enough stock to just cover the chicken pieces. Pop the lid on the pan and bring to a simmer over a medium heat. Once simmering, rest the lid on top, not completely covering and simmer over a medium to low heat for 40 minutes. 4. After 40 minutes, add the potatoes. Cook for a further 15 minutes, or until the potatoes are tender (push a sharp knife through them and it should slide in). Check the seasoning. 5. Once the potatoes are tender, add the asparagus, peas and radishes and cook for a further two or three minutes before stirring the watercress through at the end. Put the lid on and bring to the table. 6. Serve with a baguette, a bottle of rosé and a gathering of friends.